Arms fair organisers are stuck in a game of cat and mouse with peace activists. Protests in Cardiff against the DPRTE arms fair last year. Photo credit: Jim Wood. 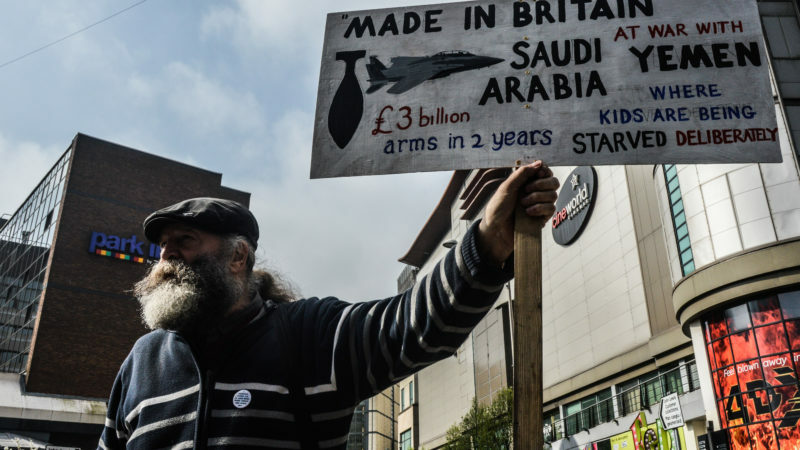 Campaigners are celebrating after a Tory-backed arms fair was forced to move to another venue – before it has even taken place. Since agreeing to host the Defence Procurement, Research, Technology & Exportability 2019, some changes have had to be made to the setup of the event in order to allow for its smooth and safe running.The complexity of the NEC campus, with multiple exhibitions, conferences and entertainment events taking place on site simultaneously, means we must always consider the impact of all events on all our guests. Reviewing the plans with the organiser has led us to believe it’s more appropriate for DPRTE to be hosted at a more self-contained venue – therefore it will now be hosted at Farnborough International Exhibition & Conference Centre. Stuart Andrew MP, Minister for Defence Procurement and Jim Carter, Commercial Director of Supply Chain at the MOD are among government figures set to speak at DPRTE this year. Left Foot Forward have been covering the DPRTE arms fair for some time.